Ready, set, fire! With this Ant-Man mask and Particle Blaster, kids can imagine battling like Ant-Man with amazing Super Hero action at any size! When Scott Lang gets recruited to suit up as Ant-Man, he realizes that being a Super Hero can be a tall order – even at half an inch tall. However, equipped with Pym technology and a few tricks of his own, Lang blasts into battle action, sometimes shrinking down his enemies with the Particle Blaster along the way. No battle is too big or too small for Ant-Man! Kids can imagine blasting the bad guys to miniature scale with the Ant-Man mask and Particle Blaster. Simply load the ant-inspired darts into the Particle Blaster, then aim, fire, and imagine shrinking down Ant-Man’s opponents! Pull on the included Ant-Man mask to imagine gearing up like the half-inch hero himself! 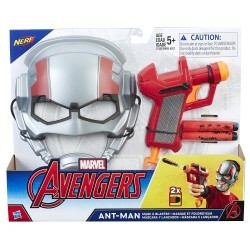 With the Ant-Man mask and Particle Blaster, kids can pretend to channel their inner ant and get ready for action, big and small! • Includes 1 blaster, 1 mask, and 2 darts.